Random House Books for Young Readers, 9780375843952, 14pp. 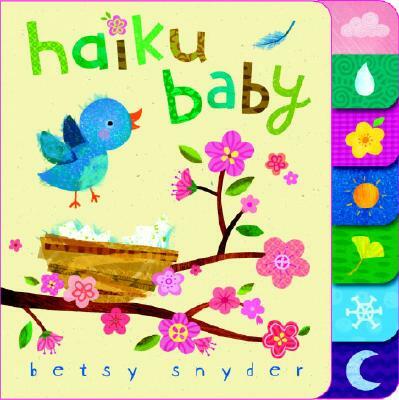 Perfect for a baby shower gift basket—Betsy Snyder's beloved tabbed board book celebrates the seasons in haiku! The simple delights in baby’s natural world—a bird, a fish, a leaf, a snowflake, a raindrop—are celebrated in the traditional Japanese poetic form, the haiku. In just 17 syllables, a moment, a season, the elements are joyfully captured. Betsy Snyder's peaceful little board book has tabs to encourage little hands to turn the pages and adorable artwork to delight everyone! BETSY SNYDER is an award-winning children's book author and illustrator. Betsy loves to create smile-inspiring art for kids and the young at heart. In addition to children's books, you can find her adorable mixed-media artwork on puzzles and games, baby accessories, plush, fabric, stickers, and greeting cards. Her work has been chosen numerous times to appear in the Society of Illustrator's The Original Art exhibitions. Betsy lives near Cleveland, Ohio, with her husband and young children. Check out Betsy's blog at BetsySnyder.blogspot.com.